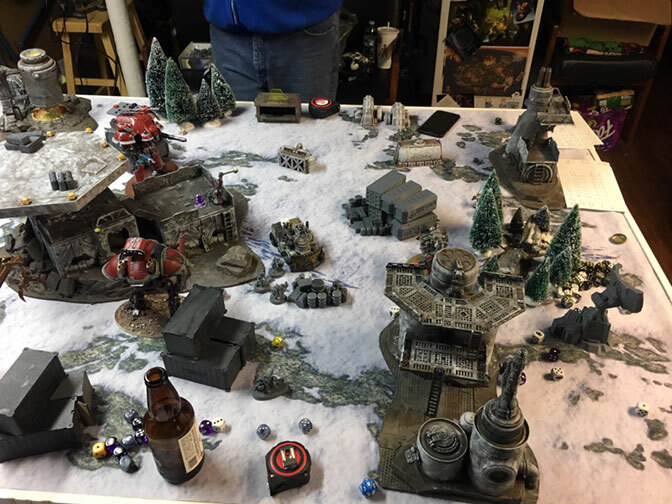 We rolled up the Beachhead mission with diagonal deployment from Chapter Approved 2018. Opting for the second turn to make best use of my cult ambush ability the Grey Knights cautiously advanced and took some pot shot at the closest Goliath Truck. The return fire form my cult and the imperial Knights was less than effective and the Grey Knights weathered the storm fairly well. Starting with the second turn the Grey Knights starting racking up points quickly from the Objectives they were camped on. As the Cultists and giant robots began to close in however the Grey Knights began to loose the war of attrition. Some drive-by demo charges cleared out a good chunk of Paladins while the Goliath tanks switched up from dousing them with Promethium to grinding through with their massive rock drills. Overall I’m happy with how the Genestealers are doing. This week I tried out the Rusted Claw traits since I was running mostly bikes and units in vehicles. Being able to shoot my Alphus with no penalty was quite good, and the relic sniper rifle meant I was doing at least one mortal wound every time it shot. The drive-by explosives Stratagem was also pretty cool. I wasn’t really able to make best use of the bikes given the mission and their inability to assault the second floor of a ruin.